This topic provides information about using a bookable resource as a pricing dimension. Before you begin, if you have not already created a pricing dimension solution, you will need to create a new one. If you already have a pricing dimension solution, then you can make your changes in that solution. If you have not created a new pricing dimension solution for your organization, complete the procedures in the Create custom fields and entities topic. To make the fields visible in the UI in the pricing dimension solution, you will need to walk through all of the forms and views of the key Project Service entities and add these fields to the forms and views of those entities. The following table is a comprehensive list of the out-of-the box forms and views, listed by entity, that will need to be updated. If there are any additional views or forms in your customizations on these entities, add the new fields to those as well. Open Solution Explorer for the pricing dimension solution and then click Publish All Customizations. In the web interface, go to Project Service > Settings > Parameters. On the Parameter page, on the Amount-Based Pricing Dimensions tab, notice that the grid on the tab shows the records in the pricing dimensions entity. Add Bookable Resource to this list of pricing dimensions as msdyn_bookableresource. Indicate the context in which the bookable resource works as a pricing dimension and set the Applicable to cost and Applicable to sales values. In the Dimension Type field, select Amount-based. Select the cost and sales priority for the bookable resource. Typically, when included as a pricing dimension, a bookable resource has the highest priority so setting this to 1 (or 0 depending on how you count the priority) would ensure that behavior. When the field name of a pricing dimension in the Role Price table is different from its field name in any of the other entities where price defaulting needs to work, the pricing dimension record must be made aware of the different names. For bookable resource, the Project Team Members entity has a slightly different field name (msdyn_bookableresourceid) from what it is called on the Role price entity (msdyn_bookableresource). The pricing dimension record for msydn_bookableresource must be made aware of this. To do this, double-click the row in the Pricing Dimensions grid to open the dimension page of msdyn_bookableresource. On dimension page, on the Related tab, click Pricing Dimension Field Names. On the associated view that opens, click Add New Pricing Dimension Field Name. 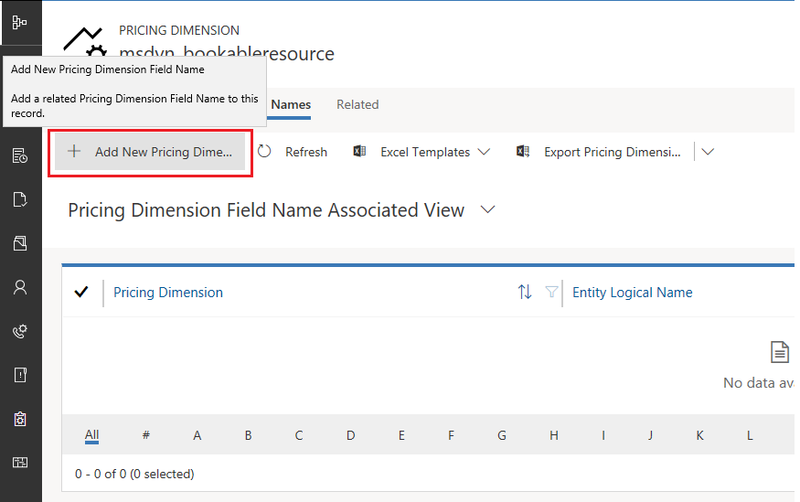 This opens the New Pricing dimension field name page for msdyn_bookableresource. 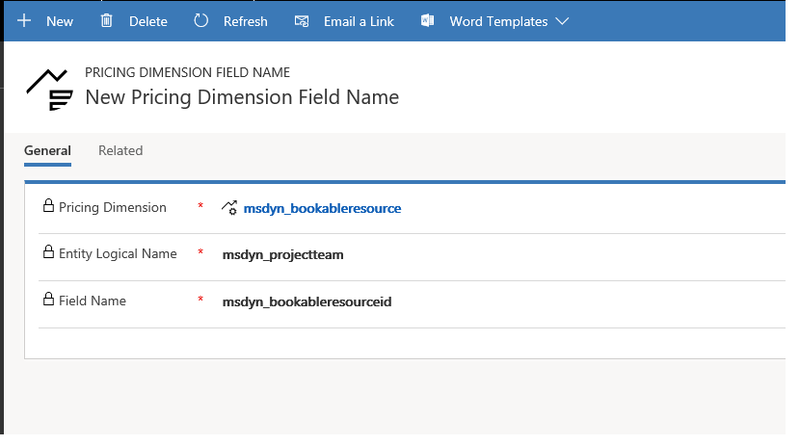 Add msdyn_projectteam to the Entity Locigal Name field and msdyn_bookableresourceid to the Field Name field. Save the record.